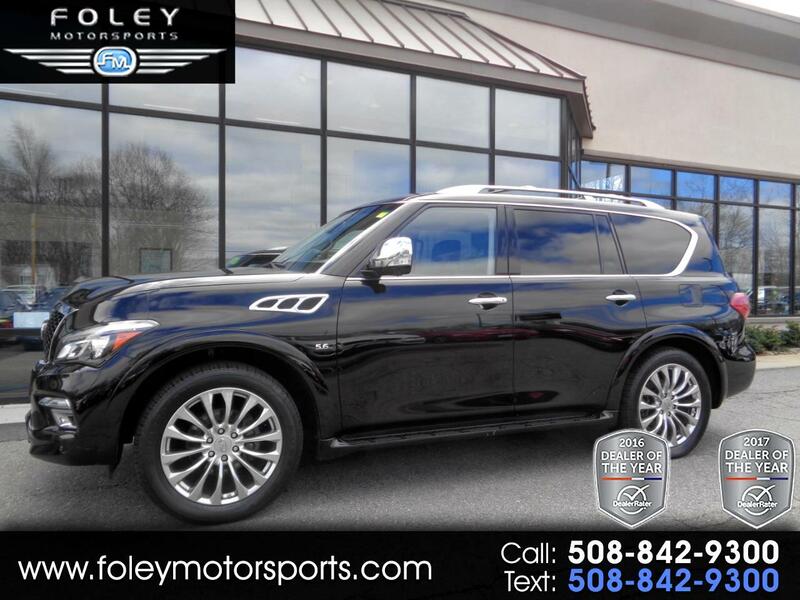 ***NEW ARRIVAL*** Infiniti QX80 AWD Sport Utility... Deluxe Tech, Theater, Driver Assist, LOADED!! 1-OWNER... LOW Miles... Completely LOADED!! 2015 Infiniti QX80 AWD Sport Utility... 400hp 5.6L V8 Engine... AUTOMATIC Transmission... Beautiful PAINT... SPOTLESS Interior... DELUXE Technology Package... THEATER Package... DRIVER Assistance Package... ONLY 40,535 Miles!! CAR FAX Certified 1-OWNER Vehicle with Infiniti BUMPER to BUMPER Warranty Coverage Included!! WELL Equipped with 20-inch alloy wheels, automatic LED headlights and foglights, automatic high-beam control, a sunroof, roof rails, rear privacy glass, power liftgate, front and rear parking sensors, keyless entry/ignition, automatic tri-zone climate control, leather upholstery, heated eight-way power driver seat, six-way power front passenger seat, driver memory settings, second-row captain's chairs, a power-folding 60/40-split third-row seat, auto-dimming mirrors and a power tilt-and-telescoping and heated steering wheel. Tech features include a 360-degree parking camera, Bluetooth phone and audio connectivity, an 8-inch touchscreen display, a voice-activated navigation system and a 13-speaker Bose sound system with a CD player, satellite radio, an auxiliary audio jack and a USB/iPod interface. The Theater Package adds a rear seat dual-screen entertainment system, a 120-volt household-type power outlet and heated second-row seats with a power tip-up feature for easier third-row access. The Driver Assistance Package includes blind spot monitoring, a lane-departure warning and intervention system, frontal collision warning, frontal collision mitigation and a back-up collision mitigation system. The Deluxe Technology Package adds adaptive front lighting, Infiniti's Hydraulic Body Motion Control suspension, an upgraded climate control system, upgraded leather upholstery and special wood trim, ventilated front seats and a 15-speaker Bose surround-sound audio system. Please feel free to contact our experienced sales team with ANY questions or to schedule a test drive. Buy with confidence from the area LEADER in Pre-Owned LUXURY. Additional 5 Year/100K Extended Warranty Coverage Available. ALL of our vehicles are meticulously detailed and serviced by our factory trained certified technicians. Call or email us at sales@rjfoley.com **$0 Down** 100% financing available with great rates! Trades are always welcome. National and International shipping quotes are available.